Do you think healthy eating = boring? Think again. There are so many exciting dishes that can be created when you have wholegrains, like oats, and rapeseed oil in your cupboard. Getting wholegrain foods such as oats, wholemeal bread and brown rice into your diet has never been easier and this selection of brand new recipes will liven up any meal time. Wholegrain foods are typically low in fat, as well as being higher in fibre to help maintain a healthy digestive system. They also add a whole lot of flavour to dishes too. This 2 part piece wil introduce you to some of the great ways to use wholegrain in both savoury and sweet dishes. They’re surprisingly simple to use, surprisingly tasty and surprisingly good! Fish cakes don’t need to contain potato! 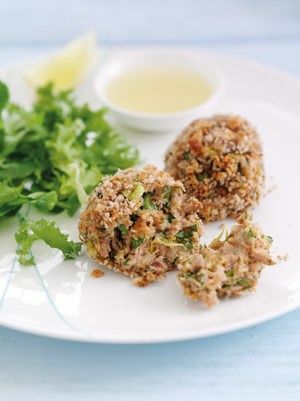 These simple to make fish cakes use wholemeal breadcrumbs instead, with tuna, lemon and coriander providing a flavour combination that’s sure to please. Flake the tuna in a large bowl, add 125g breadcrumbs, spring onions, lemon zest and coriander and mix together. Combine the beaten egg, milk and mayonnaise and add to the tuna mixture and bind together. Divide into 8 equal portions and shape into balls. Roll in the remaining breadcrumbs and place on a lightly oiled baking sheet. Bake for 15-20 minutes, or until heated throughout and crispy on the outside. Serve with mixed green salad with a dressing made with rapeseed oil. Try using toasted flaked almonds instead of walnuts. Use canned salmon or mackerel fillets instead of the tuna and for a spicy version add a little Thai seasoning. 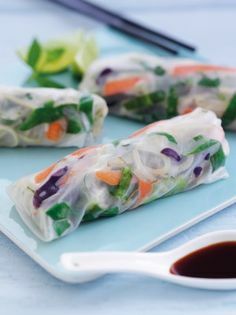 For a lunch to help keep you fuller for longer, choose these zingy, fresh, low fat spring rolls with a taste of Asia. The wholegrain noodles combined with the protein from the chicken can help keep you going until dinner time. Heat the oil in a frying pan and fry the vegetables for 1-2 minutes, allow to cool. Mix together the chicken, noodles, herbs and stir fry vegetables with the soy and fish sauces. Place the wrappers one at a time into hot water until soft and pliable (10 -15 seconds). Remove the wrappers and lightly blot on a dry, clean tea towel. Place equal amounts of the filling in the centre of each wrapper. Fold over the bottom and the sides and roll wrapper upwards to form a neat roll shape. Serve with additional soy sauce. Replace the chicken with shredded lettuce and spring onion for a vegetarian alternative, or swap the chicken for cooked and peeled prawns. Wholegrain rice has a delicious nutty flavor. 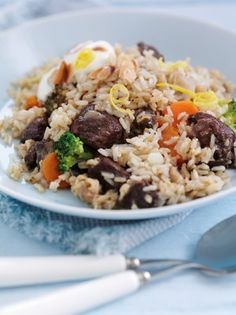 This fragrant Arabic dish is lower in fat but packs a flavour punch with its assortment of brown rice, spices, lamb and vegetables. Once it’s prepped, leave it in the oven to cook while you put your feet up! Heat 1 tbsp oil in a large frying pan, add the onion, aubergine and garlic and cook gently for 10-15 minutes or until softened but not browned. Drain and transfer to a large, deep 3 litre oven proof dish. Add the remaining oil and the lamb to the frying pan with the spices and cook on a moderate heat, stirring regularly, for 10 minutes until the meat is browned all over. Place on top of the onion mixture. Add the frozen vegetables to the dish, then pour over the stock. Finish with the rice and cover the surface with a sheet of baking parchment and then a tightly fitting lid. Bake for 1½ hours, or until the rice is cooked and the stock is absorbed. Once cooked leave to stand for 15 minutes before serving with a dollop of natural yogurt and the optional garnish if using. Serve with a fresh green salad. What do you think of these recipes? Want more delicious food news?